This weekend from the University of Pennsylvania in Philadelphia., USA Roller Sports and the PA All-Stars will together host the fourth USARS national roller derby championship. The Oly Rollers are back once again to defend their title. Also back are the high-profile (for USARS) Chicago Red Hots. The Pacific Northwest has put together another all-star roster of young talent to challenge the best of USARS. The event hosts are bringing a much stronger roster to the tournament than the one that finished in third place last year. And…well, that’s it as far as teams go. Only four of them have entered into the main competition this year. If you include the three teams playing in exhibition games, that makes seven altogether. Why so few? Since starting its roller derby program in 2012, the organization has done a not-terrible job getting players to try USARS rules, or even getting whole leagues to adopt them. But for various reasons, it has had difficulty converting those gains into tournament growth. The high point for USARS came in its first year, where 16 teams went for it across four regional tournaments. This weekend marks another new low. Maybe some of that has to do with the scheduling choices it has made, holding its championships in the middle of the WFTDA tournament season. While that’s great for people that like watching wall-to-wall roller derby1, it can cause conflicts. That happened this year, actually, with USARS regular Port City of California not able to make it to Philly due to some of its top players participating in the WFTDA Division 2 tournament in Detroit this weekend. Something that USARS isn’t waiting until next year for is the formation of its own national derby team, the one that it hopes to enter into the roller derby competition at the 2017 Roller Games in Barcelona. The national championship weekend in Philadelphia will double as a tryout for USARS Team USA, and will also include an after-tournament scrimmage for hopefuls. Last week, Dani “Sassy” Lewis of the Oly Rollers was named head coach of the team. Not a bad choice, that. At this point, it’s not completely clear what will happen with Team USA(RS) after it is selected. The organization has plans to take the team and its style of roller derby on tour, but nothing concrete has been laid down. However, if 2017 is the ultimate goal for USARS, it’s safe to say that 2016 is going to be a very, very interesting year. More immediately, the roller derby to be played at the 2015 USARS national championship is also set to be very interesting. What it’s lacking in quantity, it may make up with in quality. Most everyone in the tournament pretty much has the most experience playing USARS of anyone in the country. There’s not a lot of riff-raff here. There still may be a significant skill gap between the top and bottom teams, but the weekend’s format should ensure the best games are saved for last. All teams will play each other once in a round-robin format on Friday and early Saturday to seed them into a final bracket play. The 1/4 and 2/3 teams will then face off Saturday night to determine who plays for gold, silver, and bronze on Sunday. But even before that, there should be a few screamers. Despite the random nature of previous USARS tournaments, there always seems to be at least three or four very competitive, very close games. Unfortunately, you won’t be able to see these games live unless you live in the Philadelphia area and are buying a ticket. Circumstances have prevented webcast from happening from the tournament. USARS representatives have said the games will be filmed for later distribution, “probably on YouTube.” So at least it won’t be too long before we can see some high-level USARS roller derby action—the kind that looks something like this. Regardless, there are a lot of good players playing derby this weekend in a style of gameplay that very much promotes competitive roller derby. We therefore dub the 2015 USARS Roller Derby Nationals the “Tape-Delayed Championships.” They may not be able to broadcast it live, but it still deserves to be seen…you’ll just have to check your local listings for the time and YouTube channel to tune in to. Here are the teams and players competing in the tournament, along with the matchups in the men’s and juniors special exhibition games. The full weekend schedule, including the bracket, can be found on the USARS Roller Derby tournament website. For the third year in a row, the 2009 WFTDA Champion Oly Rollers have forgone the WFTDA tournament season, opting to keep the team together to go for yet another Seltzer Cup championship trophy. Oly has said in the past that a major reason why it has been preferring USARS is so that their junior-age skaters can compete at the same level as the adults—something only USARS allows. That doesn’t mean Oly is done with the WFTDA, of course. It played in three sanctioned games in 2015. That wasn’t enough to let them qualify for WFTDA playoffs, but it did allow them to keep a top-40 ranking. 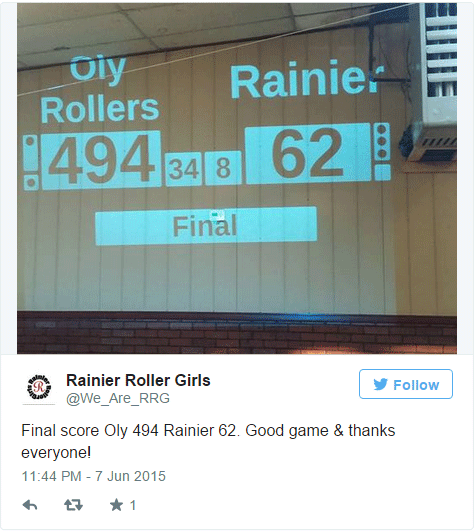 Oly is still a really, really good roller derby team, to which the final score of a recent WFTDA-rules game will remind. Oly and Rainier have an interesting connection, besides them both being WFTDA member leagues. (Rainier is ranked #131 in WFTDA). Rainier’s coach is Re-AnimateHer, the same Re-AnimateHer that skates for Oly when the team plays USARS games. This situation created a (harmless) conflict when Oly and Rainier met for the first time in 2015 during a USARS-rules game. Things were a bit more difficult for Oly (and a lot more difficult for Rainier) in that game, at least in terms of putting points on the scoreboard. It will only get tougher for them at USARS Nationals this weekend. Though Oly was never in any danger of losing at Nationals last year, two of their opponents put on very good defensive performances against them. Granted, it came at the cost of them simultaneously putting on good offensive performances—the scores of those Oly wins were 150-34 and 122-19. But teams are slowly chipping away at the Oly monolith. We’ll see how much closer anyone is to cracking it this weekend. Made up of a selection of the best skaters in the Commonwealth of Pennsylvania, PAAS will play any team, any time, any place, anywhere, under any rule set. They just want to play roller derby—all the glorious, glorious roller derbies. They also want to be very good at playing all the roller derbies, which is why they’re powering up to try to take it to Oly at USARS Nationals. Their third place finish last year was somewhat miraculous. The team couldn’t bring all its best players due to—you guessed it—conflicts with the WFTDA playoffs. The lineup they did have was hit with injuries and penalties, which reduced their bench to barely anything. Despite that, they somehow won the second half of their consolation game (which they lost, guaranteeing 3rd place) a result no one saw coming. This year will be very different. Playing in at home, the team was finally able to put together its best possible roster, including their big guns from Philly and Steel City. Teflon Donna, Hurricane Heather, Snot Rocket Science, Devoida Mercy will finally get a chance to show what they can do in USARS, not to mention the returning skaters who already know what it takes. The key to PA’s chance at a good result, and maybe even beating Oly, is how well V-Diva does. She’s very dangerous playing as a pivot…but only if she skates cleanly. Last year, she ran into a bit of penalty trouble. V-Diva has 4 penalties. In 7 minutes. Whelp. Play like that from her this year, or anyone else on the PA All-Stars, will guarantee a disappointing result. If the team can keep it clean, however, there may be a chance at a fight for first place. On the track? They’re improving, but have a ways to go. Last year, the PA All-Stars came to Chicago and won 91-31. This year, the rematch was closer, though still a 105-63 win for Pennsylvania. The Red Hots have no problem beating suburban USARS teams, but their games against the top teams expose both their weaknesses and the lack of options they have to hide them. The success of the Red Hots will anchor on Dakota “Kola Loka” Prosch, their best scoring player. When jamming, she almost always delays her breakout to wait for help covering the opposing pivot and sealing off the front of the pack, ensuring an uncontested getaway. If she can do that a lot this weekend, that means she’s able to get through the pack first on the initial pass a lot. A team that can do that regularly tends to win a lot in USARS. Though a new team to USARS play, Seattle-based NW United has the coaching staff and a few players from Antagonist Roller Derby, a team which played at USARS Nationals the past two years. That staff and those players wound up finishing in the top three both times, including a loss to Oly in the championship final last year. But this is a different team. The roster of NW is an unknown quantity, so it’s difficult to say exactly how they’ll do in Philadelphia this weekend. Teams with a lot of junior-age talent, like United has, have proven themselves to do very well in USARS against older competition. But unlike past years, everyone else at the tournament is experienced with USARS play. Being the new kid on the block isn’t so tough when everyone else is new. That’s not the case here: It’s going to be tough for NW United their first time out. 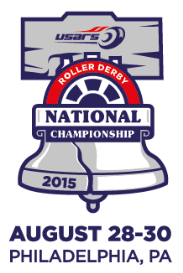 The weekend’s festivities at USARS Nationals 2015 will include a total of 12 games. Though the 10 games that make up the official tournament is strictly ladies only, USARS always tries to be all-inclusive with its events, reaching out to men and juniors to see if they want to join in the fun. This year, that has resulted in two exhibition games featuring them. Saturday’s for-fun game is the juniors-only showcase, with skaters from Philly Roller Derby’s program for the wee ones. Junior roller derby is awesome, and that’s especially true for USARS junior roller derby. This should be a fun one! The Sunday exhibition is between two MRDA squads, the Harm City Havoc and the Philadelphia Hooligans of Penn-Jersey Roller Derby. Though it will be the first USARS games for both, neither team is a stranger to active pivot gameplay. Penn-Jersey has played by MADE rules for years, which is similar to USARS. Harm City competed in the 2013 MADE banked track tournament, the Derby Ink Invitational. That experience will come in very useful for their one-shot game, which will be played after the 2015 USARS Roller Derby national champion is crowned.